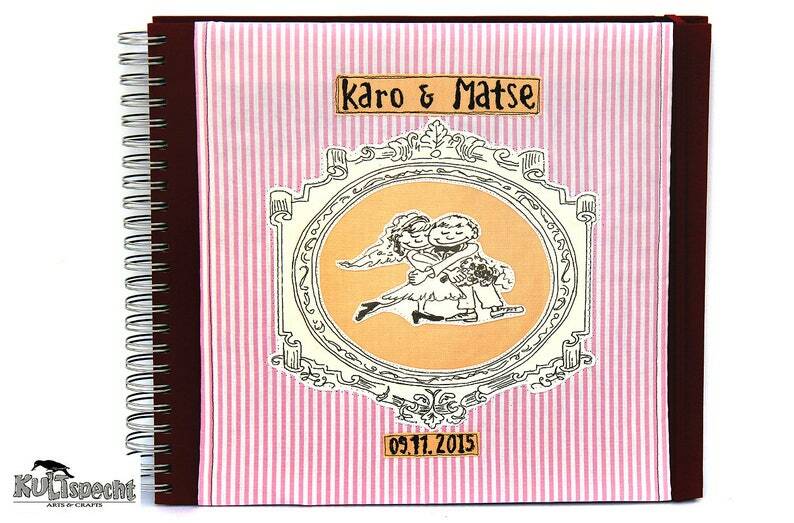 You are looking for an unconventionally different "handmade style" wedding album? Maybe it should also be a great wedding guestbook, or for the purpose of pasting Polaraid photos of all invited guests? I can offer it in two different sizes, more precisely, the cover is always the same, but sometimes on a (gold book) photo album XL with 20 sheets (40 pages), price as indicated. Or, alternatively, if you want to accommodate a lot more photos, then in a huge album XXL (semicolon Maxi Mucho) with 45 sheets (90 pages). Please select option. It can of course also be used as a guestbook, or as ordered, as a gift for the newlyweds after photos of all guests have been glued. The fabric cover is only covered and can also be washed. Name and date lettering as seen in the photo is included in the price. For a surcharge, even more individual labeling is possible. In this case please make a request for custom-made products! In the Comments field, please include your labeling wishes, also with black or white leaves. It is a kultspecht design unique. In my second shop: www.kultspechtGermany.com you can find more kultspecht products (knitting & more).